Perfect for 2D and 3D digital content creators and users of mid-range CAD and EDA applications, as well as finance and medical professionals. With the latest generation of Intel® Xeon® CPUs, the S30 delivers unmatched performance with incredible multi-core processing efficiency. ThinkStation S30 is certified to run many key professional independent software vendor (ISV) applications, including Adobe, Dassault, PTC, SolidWorks, Avid, and Siemens. Additionally, S30 includes error correcting code (ECC) memory, which drastically reduces the possibility of memory-related errors and critical data loss. 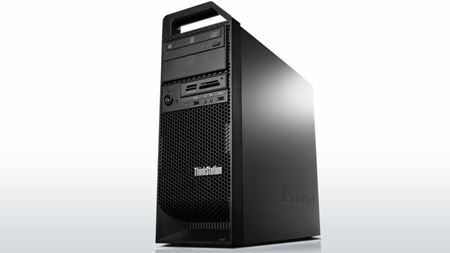 The Lenovo ThinkStation S30 features quick and easy maintenance and upgrades of key components with tool-free access to internal components. Plus, illuminated front panel and icons make ports easily accessible, especially in studio and office environments. The ThinkStation S30 continues the long legacy of unmatched reliability touted by Lenovo single- and dual-processor workstations. It's built with the same efficient thermal design and employs a tri-channel cooling process that makes ThinkStation workstations stand out from the competition. ThinkStation workstations are both GREENGUARD® certified and EPEAT Gold, while further championing eco-friendliness with up to 80 Plus Gold power supplies and 65% recycled plastics.